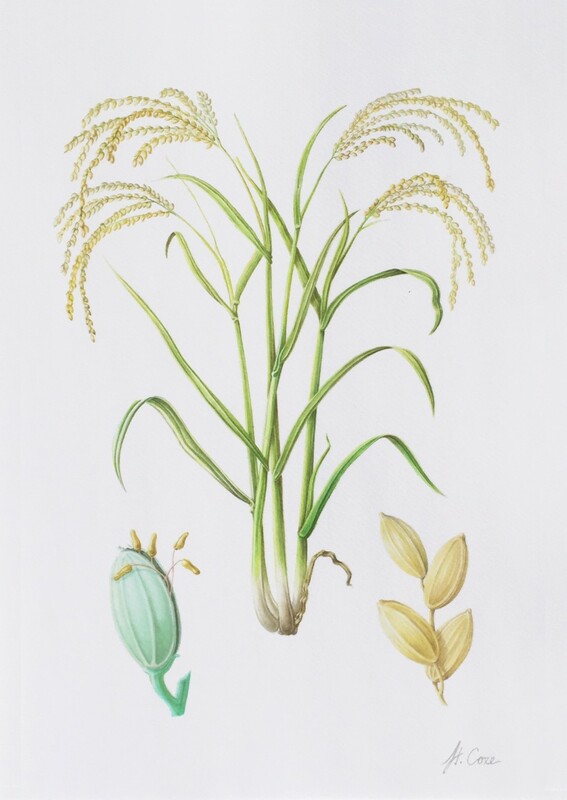 Limited 22x17 Giclee print on water color paper of Carolina Gold (Oryza glaberrima). Frame not included. Perfect Gift for any Southern Home Decor. By artist: Hagood Coxe. Miss Coxe is a graduate of Savannah College of Art and Design. She is the daughter of Mr. Campbell Coxe and has grown up on the banks of the Pee Dee River where our rice and products are cultivated. This painting is of the Carolina Gold rice, it depicts the entire rice plant as well as the fertilization and final harvest stage. As an artist she is inspired by her southern roots and the beautiful ecosystems of the South Carolina Lowcountry. Miss Coxe is currently working as a Scientific Illustrator for the South Carolina Department of Natural Recourses (SCDNR) and the rest of her work can be seen on her website: www.hagoodcoxe.com.